There’s nothing like parenting to send you to your knees. As kids grow, we moms and dads are faced with new challenges, bigger questions, and “how in the world do I handle this? !” moments. That’s when we remember the first and more important task of parenting is to pray. But what should we pray about? It’s natural to get wrapped up in immediate worries and needs of the day, like healing for a stomach bug or money to afford braces. Those are welcome prayers to God’s ears, and He is able. However, we ought to also keep the big picture in mind and pray for overall concerns in our children’s lives. 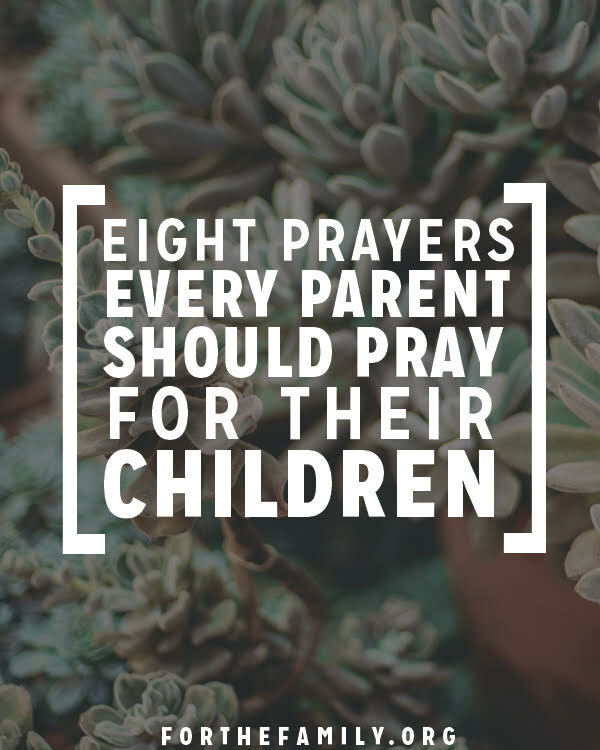 Here are eight important considerations to pray for our children regularly. 1. Pray for your children to grow “in the grace and knowledge of our Lord and Savior Jesus Christ” (2 Peter 3:18) and “in wisdom and stature, and in favor with God and man” (Luke 2:52). 2. Pray that they will know their incredible worth in Christ, and that His viewpoint would be the one they seek above all others. 3. Pray that your children would be surrounded by kind and loving friends, and that they would be a kind and loving friend to others. 4. Pray for godly mentors to come into their lives and support their faith in God. 5. Pray for the person who will one day be your child’s spouse. Pray for that child’s parents as well, that God would give them wisdom in raising servant leaders with big hearts for Christ. 6. Pray for your children’s health and safety, yet also pray for their strength to persevere and trust God through trials and disappointments. 7. Pray that your children will discover their God-given talents and purpose. 8. Pray that God will give you wisdom to love, protect, nurture and guide your children always. Wise parents will lead by example and inspire their children to become prayer warriors, too. Just as we pray for them, they can learn to pray for Mom and Dad in return! Here are eight precious prayers that we can ask our children to pray for us. 1. Pray for your mom and dad to grow in their personal relationship with God. 2. If your parents are married, pray for their marriage—that they would make each other a priority, love each other well, and seek God’s wisdom to be a good example to you of what a godly marriage is all about. 3. Pray that your parents would know how valuable they are in God’s eyes! 4. Pray that God would bring your parents opportunities to share His love with others. 5. Pray for God to give your parents patience and peace, especially when they’re stressed or overwhelmed. 6. Pray that your parents would trust in the Lord with all their hearts and not depend on their own understanding (Proverbs 3:5). 7. Pray for God to give your parents wisdom in every aspect of their lives, including work, parenting, friendships, and much more. 8. Pray that God will help you and your parents to understand and love each other well.